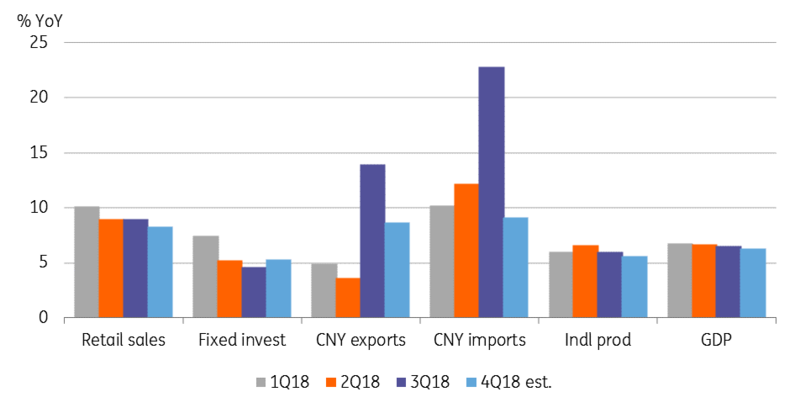 The week begins with China’s 4Q18 GDP and December data on retail sales, fixed asset investment, and industrial production. The consensus estimate of 6.4% year-on-year GDP growth is barely a slowdown from 6.5% in the previous quarter despite all the hue and cry that weighed down global markets in the last quarter. However, a sharp deceleration in manufacturing and retail sales as well as in trade growth, and falling industrial profits signal a downside risk to the consensus GDP estimate. Our house forecast is 6.3%. Net trade seemed to have offset some of the slack in domestic spending. Although export growth slowed in the last quarter, import growth slowed by more than exports and the trade surplus widened from a year ago. Net trade subtracted from GDP growth in the first three quarters of 2018 but contributed to it in the final quarter. China: What's driving GDP growth? Korea and the Philippines also report GDP for 4Q18. As with China, we think consensus growth estimates -- 2.8% for Korea and 6.4% for the Philippines -- are subject to asymmetric downside risk (ING forecasts 2.1% and 5.9% respectively). Singapore’s industrial production figures for December will indicate the direction of revision to the advance release of 4Q GDP estimate of 2.2%. It will certainly be downward given disappointing non-oil domestic exports in December. Likewise, Taiwan’s December IP data will help to fine-tune estimates of GDP growth in the last quarter. 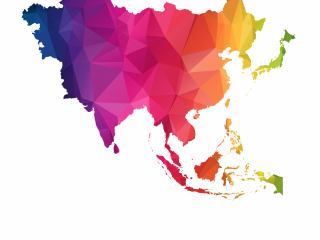 A weak end to one year makes it arithmetically harder for the following year to score well, underpinning our view that most Asian central banks will leave policies on hold this year, if not ease. Central banks in Japan, Korea, and Malaysia meet next week. All are expected to remain on hold. 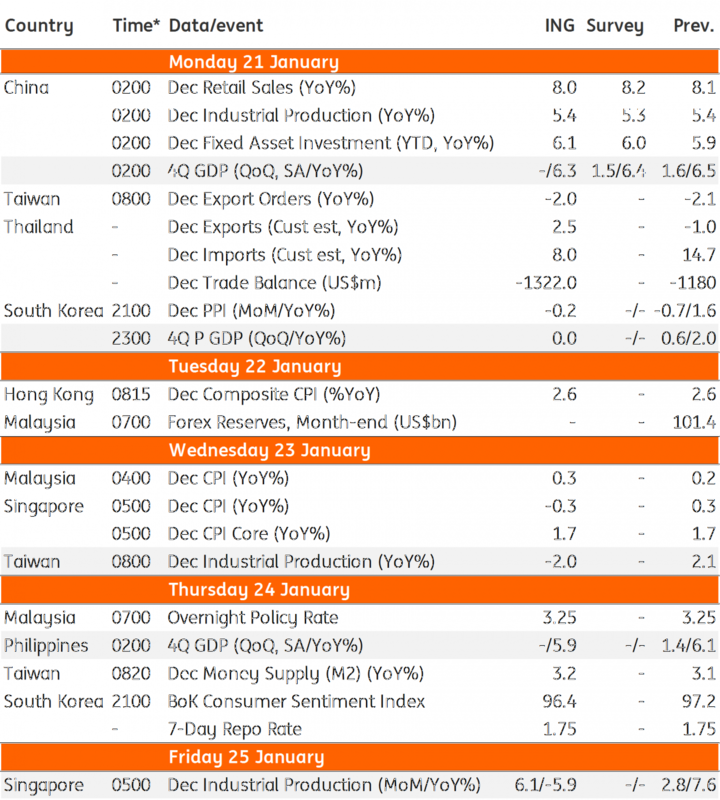 Our interest lies in the Bank of Korea’s policy as the central bank also releases its quarterly Economic Outlook on the same day (24 January). In its October report, the BoK forecast 2.7% GDP growth for 2019, the same as its estimate for 2018. The 2018 growth forecast is unlikely to be met and the pace for 2019 looks to be far off in view of the global slowdown in the tech sector. As such, a downgrade to the BoK’s growth outlook for the current year shouldn’t come as surprise to anyone. However, we don't think this will move the central bank to reverse the December rate hike just yet.